The Band includes a range of ages, from students to individuals in their 80s. The rehearsal/concert format allows musicians who are in the Keys as short-term residents to participate on a month-by-month basis. Visiting musicians are welcome to sit in on rehearsals. Adult beginners or those who played an instrument many years ago join to further their skills. Rehearsals are Monday nights, from 7:00 â€“ 8:30 p.m. in the Key Largo School Band Room, MM 105. Our repertoire includes traditional concert band music, popular music, Broadway tunes, and marches. During its concerts, the Band offers opportunities for other musical groups who may not have a regular venue in which to perform. The Island Dulcimers, the Silver Shores Singers, and the Keynoters have participated in our concerts. Small groups, such as Flutes Plus, are encouraged to play as featured ensembles. A grant from a family foundation enabled the Band to purchase a set of rhythm instruments, as well as music designed to appeal to young audience members. Children in the audience actively join in with the Band on selected numbers. Our Young Musiciansâ€™ Concert is specifically designed to attract families with children and to introduce them to concert band music and the joys of live music. 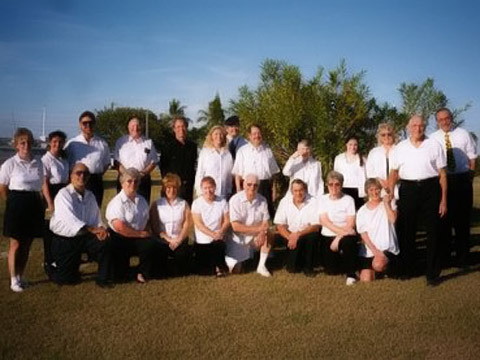 The Band is incorporated as a charitable, 501 (c)(3) organization in Florida under the name â€œFlorida Keys Community Concert Band.â€ The Monroe County Tourist Development Council has provided funding for advertising and publicity. We receive additional funding from local foundations, such as the Hurlburt Family Foundation, the Einstein Fund, and The Coldwell Banker Schmitt Foundation. We gratefully accept donations from individuals. All donations to the Band are tax-deductible. During the school year, Band members tutor young music students, offering one on one or small group instruction. Our Young Musician Award program provides music students who rehearse and perform with the Band at the Young Musiciansâ€™ Concert with gift certificates for lessons and supplies. Several members of the Band have tutored music students under the Music Mentors Program funded by the Arts Council. Many of these students have joined the Band and perform side by side with older experienced musicians.